What if you bought a can labeled “beef stew,” and when you got ready to enjoy a hearty dinner you found there was nothing in the can but water? What if you discovered fine print on the label that said “Contains no beef stew”? You would be upset. You might think that anyone would be upset and wouldn’t buy that product again. And you might think the government would chastise the manufacturer. In the grocery store, you might be right. But in the drug store, you would be wrong. That sort of thing happens every day, and no one seems to get very upset about it. The active ingredient in aspirin is acetylsalicylic acid; each pill contains 325 mg. Did you ever wonder how many molecules that equals? Of course not; why would you? You could calculate it if you were a chemistry whiz, but you probably wouldn’t want to bother. Would you like to hazard a wild guess? A billion molecules per pill? A trillion? More? Much more? Yes, much more! The answer is there are 1,000,000,000,000,000,000,000 molecules of acetylsalicylic acid in each pill. One followed by 21 zeros. That’s a lot of molecules! But even that isn’t enough to stop your headache; you have to take two of those pills. You wouldn’t want to buy aspirin that contained only 10,000 molecules per pill, and you certainly wouldn’t want to buy aspirin that contained not one single molecule of acetylsalicylic acid. But people buy Oscillococcinum all the time. It’s a homeopathic remedy manufactured by the Boiron company. The front of the package says it is for treating flu-like symptoms: feeling run-down, headaches, body aches, chills, and fever. It’s on the shelves of your neighborhood drug store right along with the aspirin and the over-the-counter cold remedies. A package of six pills costs $15.49 at Walgreen’s; that’s $2.58 per dose. They sell a lot of it. It brings in $15 million a year in the United States and is one of the ten top-selling drugs in France. Believe it or not, the information on the back of the box reveals that it contains no active ingredient at all. Not a single molecule. 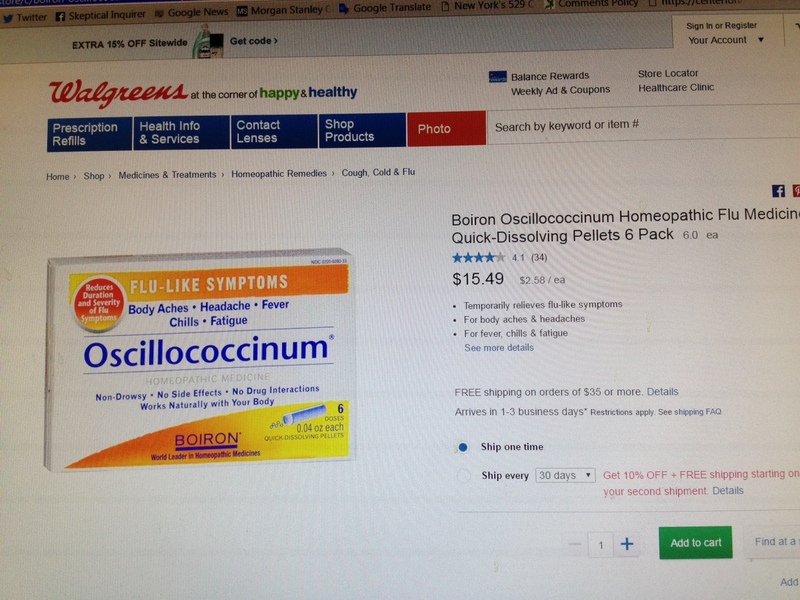 Oscillococcinum listed on Walgreens Website. You might wonder “Why duck liver?” It’s a long story, but basically a French doctor fooled himself into thinking he had discovered a new bacterium called Oscillococcus in the blood of flu victims during the 1918 flu epidemic, and he thought he saw the same imaginary bacteria in a specimen of Long Island duckling liver. He compounded one mistake with another, and with typically flawed homeopathic reasoning, he concluded that dilute duck liver ought to cure the flu. 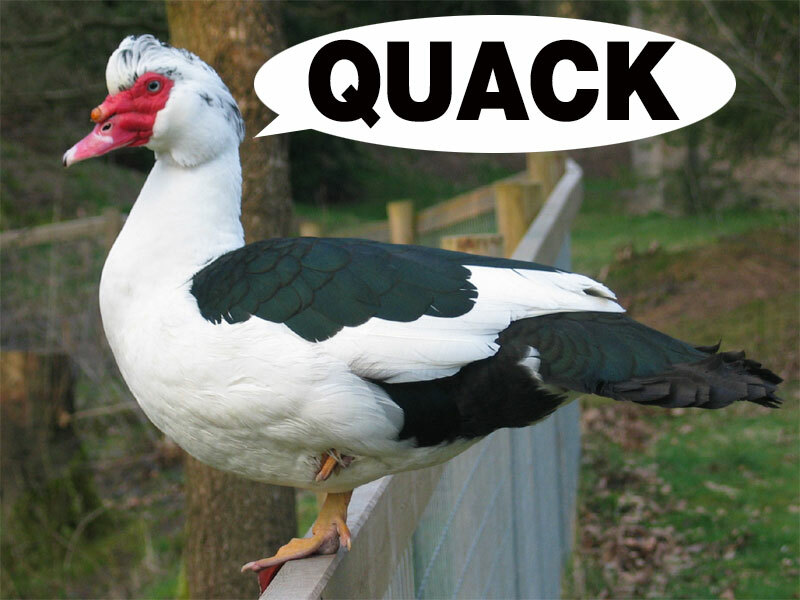 Why is Oscillococcinum made from Muscovy duck instead of Long Island duckling? Why the duck heart? I haven’t the foggiest idea, but it makes as much sense as anything else in homeopathy. If you found out you had been paying $2.58 for a sugar pill, wouldn’t you feel foolish? Since you are reading a skeptical website, you probably know what homeopathy is and wouldn’t have bought Oscillococcinum. But others in the general public don’t have your critical thinking skills or your knowledge. They don’t know what homeopathy is, and they don’t want to know. They want something they can take to make them feel better. They want to believe it will work; they want hope, even if it is false hope. They don’t care what the scientific evidence says because “science doesn’t know everything”; they’re more impressed by anecdotes from the Internet and from their friends. If Aunt Betsy said “it worked for me” that’s good enough for them. If it’s on the shelves of the drug store, they assume it must work or the government would have removed it from the shelves. Wrong! I had a good friend who was intelligent, well-educated, and skeptical about most things, but she never thought to question homeopathy. When I suggested a book about it, Homeopathy: How It Really Works by Jay Shelton, she refused to read it. She said, “I know it works for me, so we’ll just have to agree to disagree.” In other words, “Don’t try to confuse me with facts; my mind’s made up.” In at least one case, homeopathy didn’t work for her; she had to stop taking her homeopathic sleep remedy because she thought it was giving her side effects! To paraphrase Gertude Stein’s comment about Oakland, “The trouble with homeopathy is that when you get there, there isn’t any there there.” Homeopathy has been called “the ultimate fake” and “delusions about dilutions.” Oliver Wendell Holmes thoroughly demolished homeopathy back in 1842 in his lecture and subsequent book “Homeopathy and Its Kindred Delusions.” It’s been 174 years, folks! Why are we such slow learners? At least since there’s nothing in the remedies, they’re not likely to cause harm except when people use them in place of effective conventional medical care. But that happens all too often; some of the resulting deaths have been reported on the What’s The Harm? website.